In shade gardens Hosta are emerging with layer upon layer of their green leaves pushing upward from their rhizomes. Hosta is a perennial, herbaceous plant that can grow in either moist or arid soil. This lush plant plays an important role in gardens where light filters through trees. The long, ovate leaves of Hosta are ribbed with prominent veins that reveal a surface upon which light and shadow interact to create a rich texture. A Little of Hosta History: Hosta originated in the wild in China, Korea and Japan. Japanese landscape architects developed this plant as an essential component of their design. 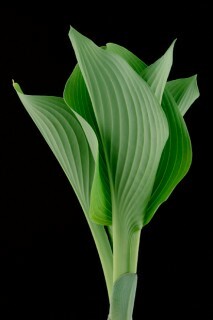 In 1712 the Japanese government gave permission to the Dutch East Indian Trading Company to export Hosta. At this time the plant was not called Hosta. In the 17th century Englebert Kaempfer (1651-1750), a Dutch botanist and physician, first wrote about Hosta. He studied and created botanical drawings of two different Hosta plants. With pre-Linnaean descriptions, Kaempfer named them Gibbooshi, noting that the leaves were “plantain-like”, similar in shape to the leaves of Lilies. The Hosta flowers, as in Lilies, are funnel-shaped. When Linnaean nomenclature became the style for naming plants, Carl Thunberg (1743-1848), also a physician with the Dutch East Indian Trading Company, renamed the Hosta Aletris and classified it as a member of the genus Hemerocallis. Finally, in 1812 Leopold Tratinick, an Austrian botanist, once again renamed the plant honoring Nicholas Thomas Host, royal physician to Emperor Francis II as well as an avid botanist who studied and published books about grasses. In the late 19th century, Dr. Philipp Franz von Siebold of Leyden University owned a nursery where he cultivated many different types of Hosta. Through his work Hosta gained popularity in Europe. For about 100 years the variety of Hosta remained at around 30 different species. In the mid-late 20th century Hosta cultivars increased to over 2,000 varieties ranging in size, leaf color, variegation and texture.